Centristic Structural Steelwork South West, Devon UK. Centristic offers a diverse range of products and services including the design, supply and installation of steel framed structures, Strengthening Steels, Bridges, Canopies including large staircases and access structures, all from our Devon based office. We provide a service tailored to your needs, providing a full design service to engineer the best solution for your steel framed structure, or work with your architect/engineer to provide the connection design and workshop drawings. 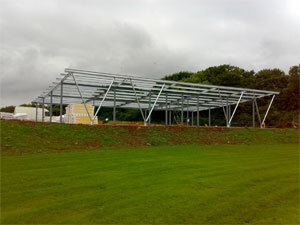 We fabricate all types of structural steelwork using fully experienced and qualified welder fabricators. If required we can deliver steelwork to the site and erect it using qualified CSCS, IPAF & CITB Slinger/Banksmen and registered erectors. At site level we operate from a fleet of 6 fully equipped vans. No job is too big or too small, we are happy to provide beams for your home extension or a whole structural portal frame.